Who was/were the alleged surveyor(s)? “Carte des Etats-Unis: Provinces Meridionales” (above) was published in 1799 in François Alexandre Frédéric, duc de la Rochefoucauld-Liancourt’s book, Voyage dans les États-Unis d’Amérique, fait en 1795, 1796 et 1797. That same year, an English translation of the book, published in London, contained a similar map, “Map of the Southern Provinces of the United States“, that also shows Surveyors Ferry. 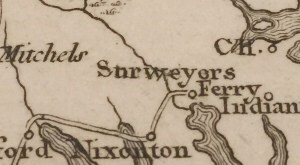 One will not find Surveyors Ferry on any earlier map from the 1790s, nor on any printed map for more than 60 years prior to these 1799 maps. 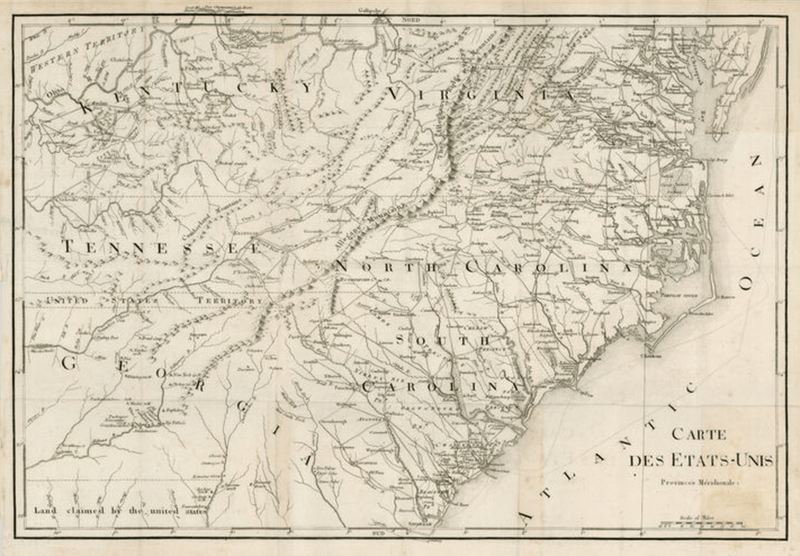 One must go all the way back to the 1733 Moseley map of North Carolina to find the source, and even there you won’t find Surveyor’s Ferry. In fact, the original spelling was Sawyer’s Ferry! Detail of Edward Moseley’s 1733 map of North Carolina, showing Sawyer’s Ferry across the Pasquotank River. Image courtesy of East Carolina University. 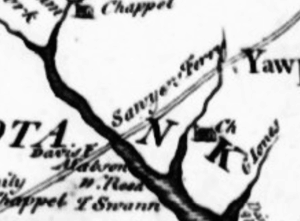 Stewart Dunaway, the foremost authority on colonial ferries and bridges in North Carolina, found no mention of the establishment of Sawyer’s Ferry in the extant colonial records held by the State Archives. (The ferry was obviously well established when referenced in 1784 state legislation.) 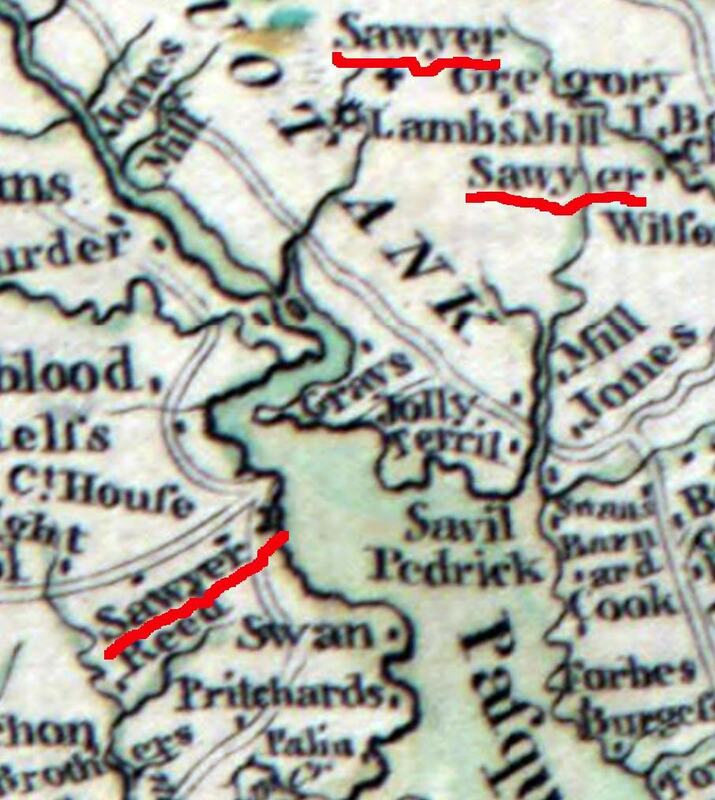 Sawyer was a common surname in Pasquotank County as early as the late 17th century. 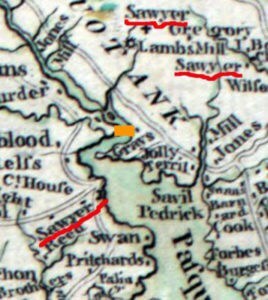 No fewer than 3 Sawyers are located on the 1770 Churton-Collet map (below). The ferry is not shown on the Churton-Collet map, but it was likely in the location of the “orange bar” as shown below. Given the rarity of the 1733 Moseley map, one might be surprised that it would have been used over 60 years later as a source. If anyone finds more evidence on François Alexandre Frédéric’s 1799 map that Moseley’s map was used as a source, or finds “Sawyer’s Ferry” on any printed map published between 1733 and 1799, please let us know via the “What’s on your mind” comment box below. As a final comment, careful observers may have noticed on la Rochefoucauld-Liancourt’s map that the engraver seemed uncertain about the place name. 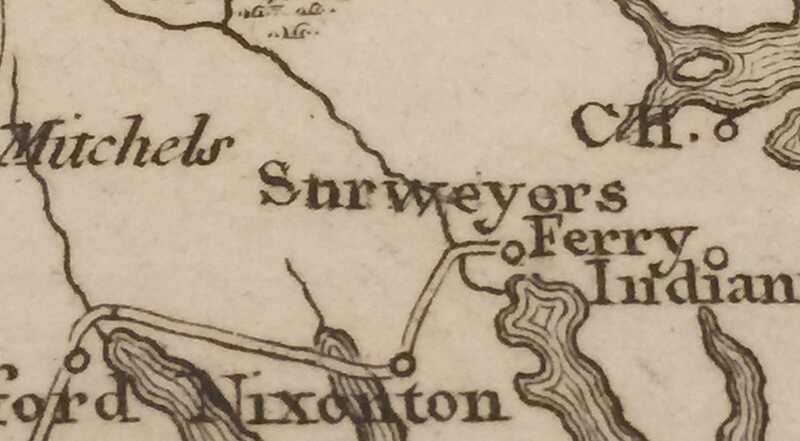 “Surweyer’s Ferry” [sic] appears to be engraved over an incomplete erasure. If someone can decipher the original engraved text, please let us know. ADDENDUM 8/2016: There is some discussion of early Pasquotank River ferries on pages 22 & 23 of Ante-Bellum Elizabeth City:The History of a Canal Town, © William A. Griffin 1970. Murder in Pasquotank County, Surveyor’s Ferry… we need one more story to hit the Albemarle Sound region trifecta. Stay tuned! 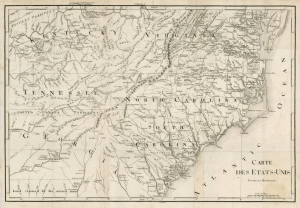 This entry was posted in 18th Century, Map errors, NC Transportation, What's in a name? and tagged Edward Moseley, La Rochefoucauld-Liancourt, Sawyers Ferry, Surveyors Ferry by crmaps. Bookmark the permalink.